Is this your year to run the marathon? After running in Chicago for several years, I’ve experienced the joys and challenges marathons offer. One of the most popular marathon destinations in the country, Chicago hosts a flat and fast course that appeals to those from hilly climates. 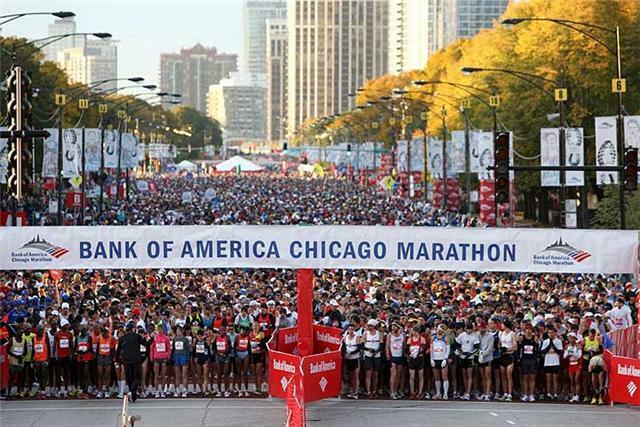 Not just a tourist attraction, the Chicago marathon is great way for locals to take advantage of Chicago’s natural beauty and friendly spirit. 1. Registration is now lottery based. Unlike the guaranteed pre-sellout signup of previous years, you’ll submit your registration on March 5 at 12 p.m. (up until April 7 at 12 p.m.) on the Chicago Marathon website. Runners will be chosen at random to fill the 45,000 spots, and will be notified via email on Monday, April 14. Make sure your credit card is in good standing, as you will be withdrawn if your card doesn’t run correctly on the 14th! While your registration cannot be refunded or transferred to anyone else, if your plans change you have the ability to defer your entry to the 2015 race (but will be charged both years). The only way to guarantee entry (if you’re not a super-fast runner who has done the marathon a hundred times) is to sign up through a charity… and fundraise at least $1000 (fundraising amount varies by charity). If you’re great at collecting money from your friends and family, make sure you go through one of the Chicago Marathon’s official charity partners (list coming soon). 2. You will have no social life from April through October. This is not necessarily a bad thing, as the glory that comes with a marathon finish is worth it. First, set your training plan. Utilize resources from sites like Runner’s World or Nike’s Chicago-specific plan to map out your weekly runs and cross-training. Long runs are, well… long, so set expectations with your friends and family that you will be MIA for months on end. Through the summer, you’ll embark on your long runs early Saturday mornings, as the heat (hard to imagine at this point) creeps up early in the day. Friday night drinking is not advisable before your critical training runs, so you might be more of a Sunday Funday-type this year. 3. You will see more of Chicago’s beauty than you ever imagined. While there are many parks, roads and routes to run in Chicago, I prefer to stay away from intersections and crazy drivers and therefore take all my training to the lakefront path. With 18 miles of gorgeous views of the lake, the trail runs from 5800 North all the way to 7100 South. Seeing the skyline from many miles south as well as many miles north of downtown is incredibly breathtaking, and puts in perspective how far you’ve just run (those skyscrapers look really small from far away)! In addition to the scenic beaches, gardens, museums, boat harbors and more that you’ll come across, you’ll also see the beauty of Chicagoans out and about enjoying the city. During the race, I had the pleasure of seeing neighborhoods I’d never been to before – the dancing dragons and golden red gateway to Chinatown, the Mexican artwork along the streets of Pilsen, and more. The race itself is a true tour of Chicago and the many faces cheering along the course make up a diverse network of Chicago’s citizens. 4. You will meet lots of cool, passionate people. Runners love talking about running – about their experiences, insider tips, and what to expect on race day. The supportive community you will meet when training for a race is incredible, and it’s an easy way to build a network. Shopping for new shoes at Fleet Feet? The salesperson will be happy to tell you about the races he or she has run. Join up with CARA or another runner’s group to have side-by-side support during your training runs. If you sign up with a charity, you’ll also have a network of like-minded people all running for a cause. Not to be overlooked, the pre-race expo (held at McCormick Place) is an opportunity to learn about sponsoring businesses, new products and others who share your passion for running. 5. Your bucket list will thank you. Running a marathon is quite an ambitious goal – one that many set out on their “bucket list” to accomplish in their lifetime. Signing up is the first step. After months of training, not without its pains and challenges, the joy of streaming through the finish line in Grant Park is completely earned, all on your own. You now have the right to wear your shiny medal all day long – to brunch, to walk your dog, etc. – just not out for another run! You’ll need time to rest and recover and reflect back on what you’ve just accomplished. Good luck to all the runners out there! I love number 3! Running through Chicago during the marathon is amazing. You really feel the support of the entire city.